When I started working on this How-To on building a simple Markov chain (a useful component of model-building), I came across this great visualization at Setosa Blog. Clearly, after this and the really incredible Segregation visualization that Iza posted about, I’m starting to feel the need to step up my data viz game. So before you read on, have a look at the visualization because it does a really good job of explaining the fundamentals and gives you a chance to play with a Markov chain yourself. I’ll just briefly cover what Markov chains are, and then we’ll get into using Markov chains in an ABM using NetLogo. Markov chains are useful for dealing with phenomena that are auto-correlated: that is, the future state of the phenomenon depends on its current state. When this is true, we may not be able to accurately model the phenomenon as a random probability draw. To use this method, we need to know what the current state of the phenomenon is, and what the likelihood is of the system transitioning to another state. 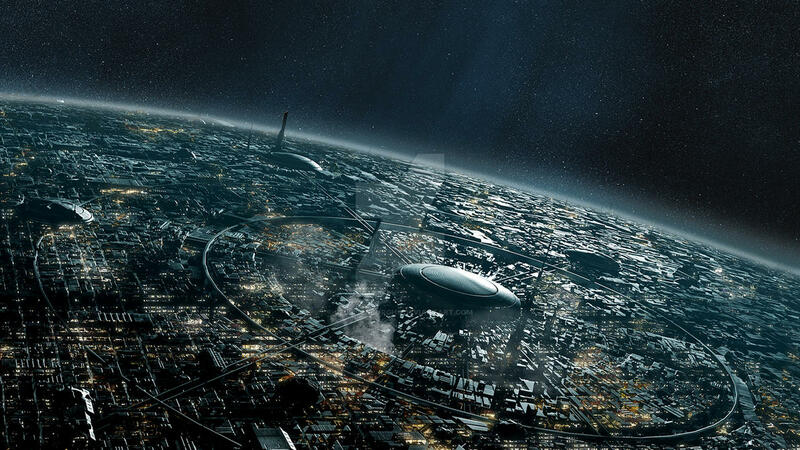 The weather is often used as an example. In ecological modeling, we often want to model rainfall because pretty much every living thing on earth depends to some degree on the frequency and regularity of rainfall. Let’s look at the rainfall data for Boston, Massachusetts in April of last year (courtesy of Weather Underground). More data would be better, and Weather Underground has Boston weather going back about 95 years. 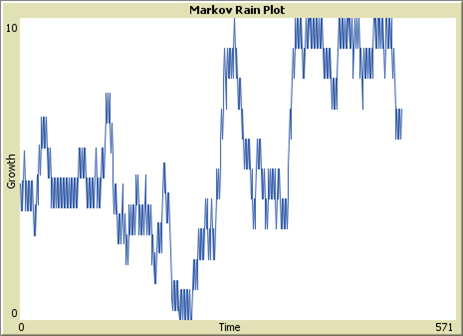 But with these transition probabilities, we could build a Markov chain that simulates the sequence of rainy versus clear days in April in Boston in a way that captures some of that auto-correlation. 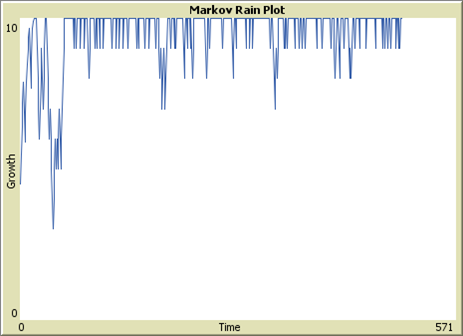 Let’s say we wanted to model grass growth in NetLogo, using a Markov chain like the one above to simulate daily rainfall. First, we’ll open a new model, head over to the Code tab, and create a global variable for the weather. We can also consider grass as a component of the patches in the model, and the grass could be in various growth stages, which we’ll call growth. Next, we’ll set the model up so that we start off in one of two weather conditions: “WET” or “DRY”. 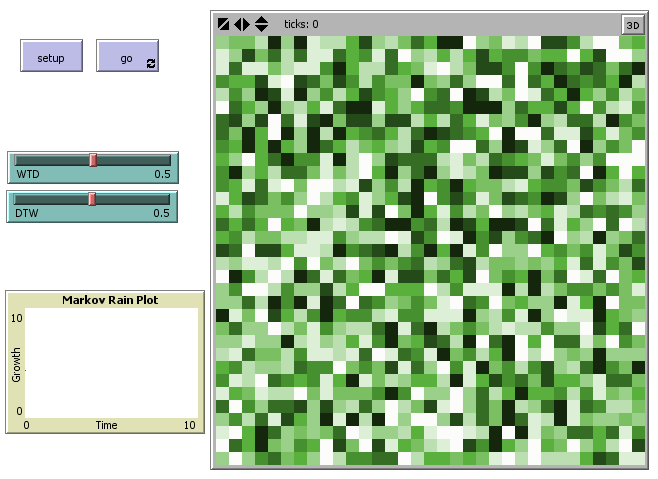 We’ll also set up the grass so that growth is randomly distributed between 0 and 10 among the patches (we code this as random 11 to account for 0), and we’ll color the patches according to their growth using the scale-color command (darker = more growth, lighter = less growth). 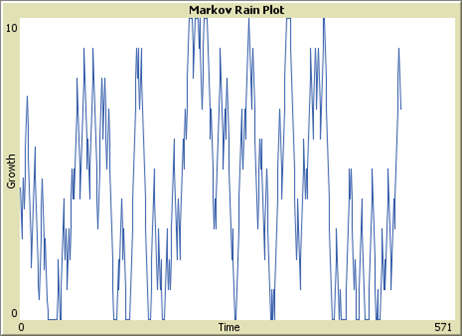 Then, in the go procedure, we’ll have two functions: markov-rain and grow-grass, that will repeat during the model at each time step, or tick, until a limit of 500 ticks is reached. 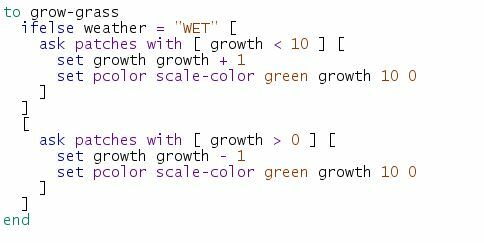 The markov-rain procedure will determine the transitions between “WET” and “DRY” weather, and we’ll use variable placeholders WTD for the wet-to-dry transition, and DTW for the dry-to-wet transition. This might throw up an error about these variables not existing, but we’ll get to that later. What’s happening here? 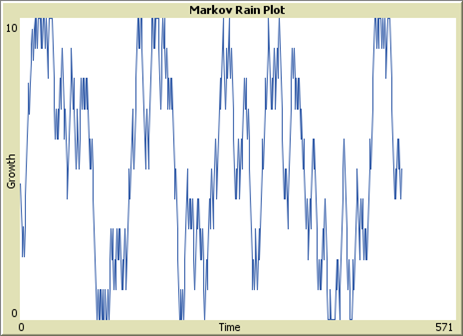 To use a Markov chain in NetLogo, we need to know what the current state of the process is, in this case the current weather, and then apply our transition probabilities to determine whether the state has changed. Here, we use the ifelse command to determine whether it is currently “WET” or “DRY”, and then determine the next state using the appropriate transition probability (WTD if conditions are currently “WET”, DTW if conditions are currently “DRY”). If a random number draw between 0 and 1.000 is less than whatever the value for the transition is, then the weather will change to its opposite state; otherwise, it will remain the same. The grow-grass procedure will again use ifelse to determine the weather. If it is “WET”, any grass which has not reached the maximum growth level of 10 will grow by one unit. If it is “DRY”, grass which has not reached the minimum growth level of 0 will grow by one unit. When both the WTD and DTW are set to 50%, the rainfall effectively follows a random walk between dry and wet, as we might expect. This produces grass growth that varies randomly over time. If we use the sliders to change the conditions so that it is likelier to transition from dry to wet (DTW = 80%) than wet to dry (WTD= 20%), the outcome is fairly predictable: wetter conditions on the whole, meaning greater vegetation growth (top image). When the transition is the other way around (DTW = 20%, WTD = 80%), conditions are drier which means less grass growth (bottom image). When both transitions are set to 80%, we get fewer dramatic sways in vegetation growth. Why does this happen? The answer lies in the likelihood of transitioning and the buffer provided by the growth factor. In the 30%-30% scenario, the likelihood of transitioning overall is low, but when it does happen, it’s more likely to stay in whatever state it transitions to, swinging the vegetation to one extreme or the other fairly rapidly. Under the 80%-80% scenario, there is a greater likelihood that a wet day will be quickly offset by a dry day (and vice versa), which has a balancing effect over the short-term. This is an interesting behavior that may not be intuitive without building and running the model first. Of course, this is a very simple model, and I sincerely hope no one would actually attempt to predict the weather or vegetation growth with it (DISCLAIMER: No, really, don’t do it). How could it be improved? Well, for starters, while we model rain/not rain in binary terms here, we know that the intensity of rain can vary tremendously. Since there is no limit to the number of states we can use, we could add further numbers of states and transitions to model the likelihood of going from drizzle to deluge and all points in between. Furthermore, the transition probabilities are likely to change over the course of the year, relative to seasonal changes. There are also likely to be changes from year to year or decade to decade relative to global climatic cycles. Adding these different levels of change could be accomplished by treating each smaller scale time period as nodes within a larger Markov chain with its own transition probabilities. But we might also use Markov chains for modeling adaptive agent behaviors as well. Oftentimes, we want agents that don’t follow the same script by rote each time step. For instance, an agent might eat at its favorite restaurant x% of the time, but y% of the time it might try something new. How do different settings of x and y affect the ranging patterns of the agent? What if the agent changes the likelihood of eating at particular restaurants based on dining experiences? What determines how likely a restaurant is to be visited? Each agent could develop an entire decision-making schema and subsequent evolving ranging patterns through the process of exploring and adapting a simple Markov chain like the one presented here. The historical background on Markov chains gets explained like a pro in this video from Khan Academy. This set of short videos from Scott Page’s Model Thinking course does a good job of providing an overview, and explains the Markov Convergence Theorem in more detail. This freely available book has a good overview of how Markov chains work mathematically in Chapter 11. This paper by Izquierdo and colleagues gives a very thorough treatment of computer simulation and Markov chain analysis.